TC and I decided to try somewhere new for breakfast. 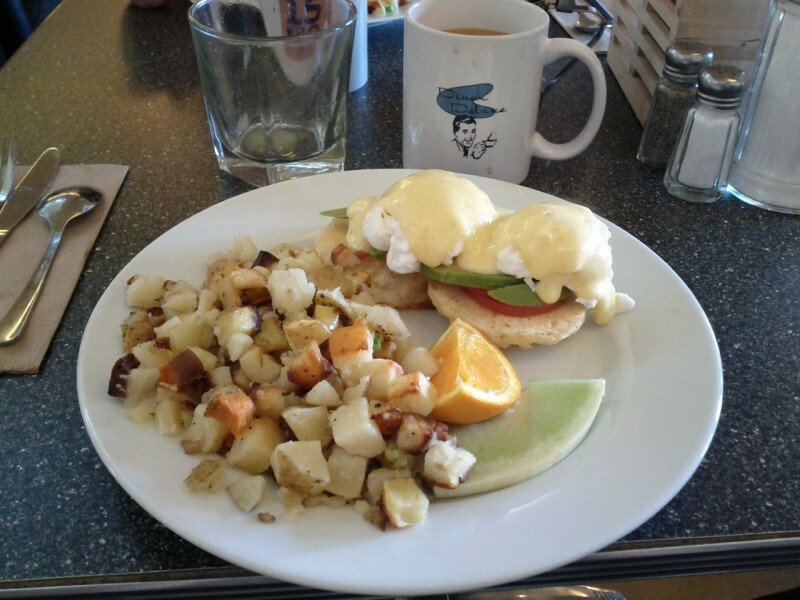 Research by TC provided two places in Calgary that we should try but hadn’t and Diner Deluxe was one of them. It had been noted in other blogs as similar to Galaxie, which we both like. After a short drive up to Edmonton Trail, we found street parking just around the corner on 7 Ave NE and went into the diner. Arriving at about 08:30 it was about half full and we had our pick of tables. Shortly after being seated a couple decided to relocate next to us, with their young child. This always makes me a little worried as the child screamed randomly and I was constantly worried it was going to throw or cough in my general direction. Such are the dangers of eating out. The diner itself is decorated with a surf/vintage theme, it was clean and respectable with comfortable bench seating against the wall and reasonable looking seats that didn’t elicit any complaints from TC. The coffee was average, fairly typical of a diner and not overly strong. I also had a pineapple juice that helped me to rehydrate. The prompt and courteous waitress offered a special of eggs benedict with roma tomatoes and avocado that I decided to try and TC went with eggs benedict with spinach and chorizo. Both came with hash browns and instead of english muffins the eggs were served on home-style biscuit. The food was pretty good and the coffee as noted above was average diner coffee. The location is easily accessible, so I would definitely come back here. The cost including tax and tips was $40. As a nice bonus, next to the diner is the Urban Baker. TC picked up a loaf of their ‘Tuscan’ Bread which is a sour dough. I haven’t yet heard what it was like.